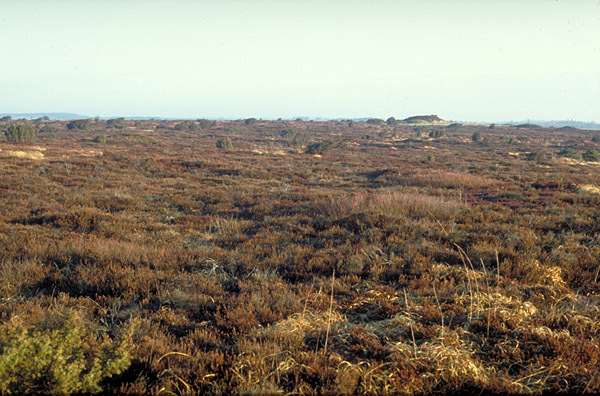 The heaths in West Jutland lies on the sandy soil deposited by melting water during the last ice age. The heaths have developed during the Iron Age when man cleared or burned the forests and cultivated the land. The sandy soil quickly lost its nutrients by mans overuse of the land, and the heath plants spread on the poor soil and became common. Through grazing, especially by sheep, the vegetation on the heaths was kept low. If the agricultural use of the heaths are removed, the vegetation will change to grassdominated dry land and finally to forest. To save the heaths and their special vegetation it is therfore necessary to use them as in earlier times, and in the protected nature reserves the heaths are grazed by sheep or regularly burned. The picture shows a newly burned part of a protected heath. The area ("Vind Hede") is a nature reserve because the very rare black grouse are breeding here, or correctly bred here, as it is now extinct in Denmark. This bird prefers a very low vegetation and the burning also favoured some rare species of plants.